Apparently, in Chapter 112 of the Attack On Titan manga, Eren says that Mikasa is a slave. For all their life it seems they have been friends. Has their friendship been broken because of this? Also, if possible, leave some theories as to what may happen between the two, e.g. a fight. 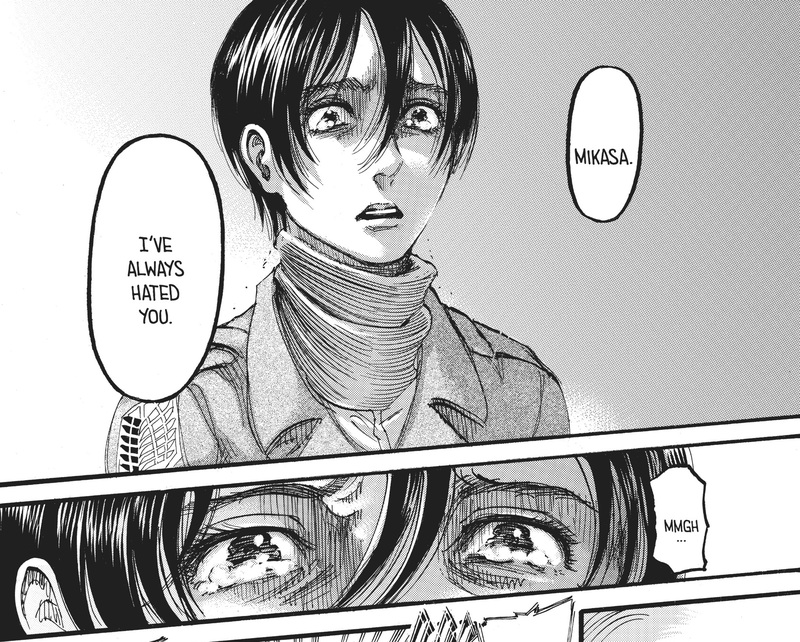 If you look at the succeeding pages of Chapter 112, Eren does indeed say that he hates Mikasa and revealed that he has done so ever since they were kids . Whether he means it or not, however, is a different matter altogether. He could or could not be lying. The reason for him doing so or if he did lie, we cannot know yet as of now due to lack of information. it was revealed that Eren and Zeke had a talk, with Eren agreeing to Zeke's plan of genocide to wipe out the Eldian race. The reason being that if they were never born in the first place, there would be no suffering and Eren views it as their 'salvation'. Him pushing away everyone he knows, including his two close friends, Armin and Mikasa, was probably to ease the pain he would feel and sever any attachment or feelings he felt towards the two, knowing that he would be responsible for their deaths soon, if their plan succeeds. it was revealed that Ackermans awaken their powers when they recognize someone as a 'host'. Eren was recognized by Mikasa as her host and someone she had to protect so I doubt that she would be able to hurt him. Even when Eren said those harsh words and Armin was about to punch Eren, Mikasa still stopped Armin, following her clan's 'instincts' when awakened. Are Levi and Mikasa siblings? What did Mikasa say when she was correcting Armin after Eren mastered the ODM gear? What does Mikasa mean by “It's happening again” in the 2nd episode? Why does Eren loses his equipment after being Titan?